Microgaming, a supplier of award-winning online gaming software to the leading operators worldwide and Just For the Win have announced that they will be releasing a new action-packed, Japanese cyberpunk themed slot game next month titled Shogun of Time. 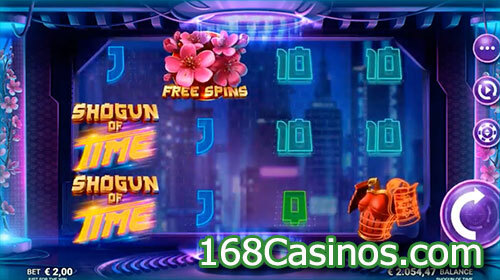 The game play on the new slot game takes place across 4 reels and 81 ways to win to commence with, but it is possible to expand the reel set to 5 reels and 243 ways to win. Landing a 4-symbol combo during any spins will trigger the slot game’s Re-spin and Reel Splitter features where another reel is added in the center of the set with the other 4 locked into place for a single re-spin which could potentially create a screen full of profitable symbols. Shogun of Time comes with a range of Scatters, Wilds, Free Spins and more, giving players an opportunity to win up to 2,000 x their base game stake and winning up to $200,000 in a single spin when playing the slot game at its maximum bet. The top stake in the Shogun of Time slot game is 100.00 per spin while the smallest wager is 0.10 per spin. Landing 3 or more Scatters on the screen in tandem will trigger the free spins with 3 Scatters awarding 8 free spins and 4 Scatters awarding 16 free spins. Players are advised to look out for the Cyberpunk Girl symbol, Smurai Helmets, Specialized Logos, Armor and Helmets. Lower paying wins are supplied by clubs, spades, diamonds and hearts.